From her mom to her first-grade teacher to her camp counselor, a number of strong women influenced Marissa Radziwiecki growing up. Now as an adult, and a senior at IU, the East Chicago, Indiana, native has welcomed every opportunity to pay this forward to the next generation. Between joining a sorority, serving as a resident assistant and volunteering with Big Brothers Big Sisters at IU, Radziwiecki discovered what she's most passionate about: making a difference in the lives of others, especially young women. "I want to empower women to not be afraid to speak their mind and to live free of intimidation," she said. 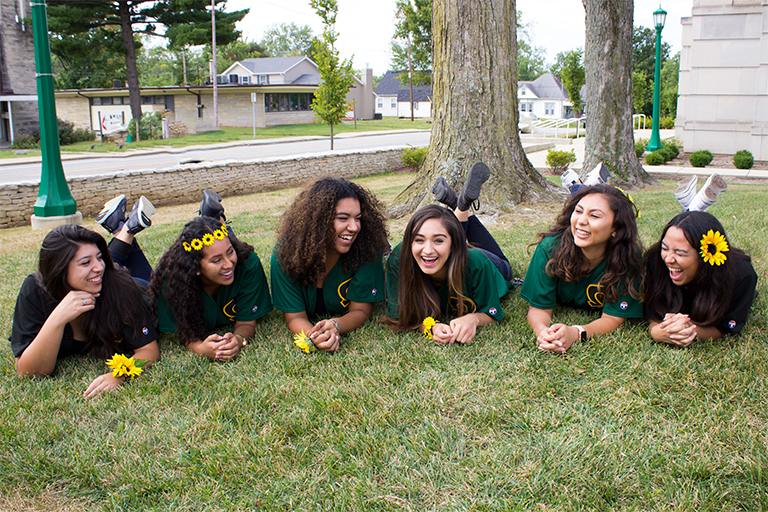 This same philosophy is what Omega Phi Beta envisions for women in society, and it's the reason Radziwiecki chose to join the Latina-oriented sorority within the Multicultural Greek Council on campus. The organization is dedicated to raising awareness for and helping to combat violence against women. Whether it's participating in the national Ray of Hope Walk to End Violence Against Women, hosting a menstrual product drive on campus, putting on their annual Week of Illumination or starting a dialogue with local elementary girls about female superheroes and historical figures during a "Shero" event, Radziwiecki and her sisters strive to spread a message of empowerment to women of all ages at IU and beyond. "Marissa exemplifies the qualities which the organization seeks in its members: care for self and others," said Sylvia Martinez, Omega Phi Beta's staff advisor and an associate professor of educational leadership and policy studies and of Latino studies at IU. "I've witnessed a strong sense of care among this group -- not only for each other but also for others, particularly marginalized women in the community. In anticipation of the holidays, the women of Omega Phi Beta will be collecting pajamas for Middle Way House, a local shelter for victims of domestic violence, for which the organization often collects needed products. They will be holding a collection for new and gently used pajamas for both kids and women from Nov. 10 to Dec. 1 at La Casa. "We are focused on raising awareness for violence against women, and that is parallel with Middle Way's mission," she said. "We want to support efforts in our community that are trying to accomplish the same goals we are." The Greek organization also strives to promote diversity as one of their founding pillars. Radziwiecki embraces her unique culture -- she's half Mexican and half Polish -- so she found a community with the members of Omega Phi Beta. Growing up, she thought she had to choose one of her heritages or the other. Since joining the sorority and being around so many different women who encourage her to be her true self, she said she has learned so much more about how cultures can intertwine. The sisterhood exemplified by the members of Omega Phi Beta stood out to Radziwiecki before she even joined the sorority. She said they were some of the first people she saw making a difference on campus and in the community, and that was something she knew she had to be a part of. "Giving back is an inherent quality of mine," she said. "In order to make this world a better place, I believe we all have to help each other out as best as we can." Radziwiecki, a 21st Century Scholar student studying psychology, began to think about how she could translate this into a career. 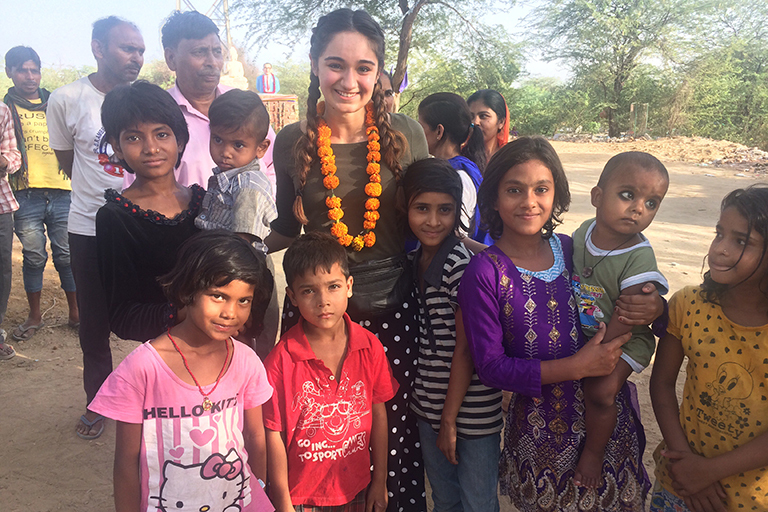 She thought she had decided on clinical work, but a study abroad experience to India through the Office of the Vice President for Diversity, Equity and Multicultural Affairs opened her eyes to the possibility of having a global impact. "The kids really got me," she said. "They had nothing. But they were still so happy; they didn't know what else was out there." After returning to the U.S. and reflecting on those experiences, Radziwiecki applied for the Peace Corps. If she's accepted as a volunteer, her first choice of placement is Costa Rica, where the organization runs the Let Girls Learn Program. The initiative focuses on empowering young women and reducing the risk for sexism and abuse. "When I was researching locations, I saw this initiative and said, 'This is what I'm all about,'" she said. This is a cause Radziwiecki believes strongly in, because she sees how it affects one's future. When she realized she had powerful women in her life supporting her, she was able to quickly embrace the mantra that she was capable of setting high goals for herself and accomplishing them. As an RA in Foster Residence Hall, she strives to create a community of support for her residents. "She is a caring and attentive person and is genuinely invested in her residents' growth and well-being," said her manager, Li Pietruszka. "Because of this, she takes the time to get to know each resident personally and individually, celebrating their daily victories with them and offering a listening ear and resources through their struggles." And Radziwiecki makes it her mission to spread this message of empowerment, whether it's with her residents or with young women across the world. "I want to educate women and break down the barriers for them so that they can go on to achieve whatever they want to achieve," Radziwiecki said. "I want them to know they can do anything."